Alexia has fought hard to overcome a tragic illness in her past. Barely getting on with her life, she finally leaves home to enter the real world. This first big step makes her appreciate all that she has struggled with. This next step in her life also leads her to a possible heartbreak. How can Alexia keep up with all of her struggles and keep going on? Phillip has lost someone close to him when he was younger. This person was the most important person in his life. He has struggled to get past this loss, and once he does, he finds out something about his favorite person that makes him feel the hurt all over again. Why can't Phillip move on for good? Can he really forgive someone in the past if they no longer live? A chance meeting has Alexia and Phillip spending hours talking. This sparks an attraction for each other. Every day, running into each other makes the attraction grow stronger until they finally give in to it. When another accident strikes, both of their pasts come barreling back to haunt them. Can they move forward knowing the secrets they now know about one another? How much more can two broken people endure? Will they find their way back into one another's arms, or have they finally come to a breaking point in life? A very sweet romance audiobook that I really enjoyed listening. The narrator added to the total enjoyment listening to this audiobook. Loved the whole story. The characters emotions I could feel. The narrator brought all these characters to life and the many voices that this narrator used was fantastic! Love being able to hear the emotions and feelings of what the Alexia and Phillip went through. Would you consider the audio edition of Last Heartbeat to be better than the print version? No I think both versions complement each other, as a matter of fact, I read along on my kindle as the audible version is playing. What was one of the most memorable moments of Last Heartbeat? To me when Phillip finds out Alexia had a heart transplant and the way he found out -it is heart wrenching, and when other factors come up about the transplant he is overwhelmed. No this is the first one, and I liked it! This book was the first book I read and listened to, and I found myself really feeling what was said on the pages. It is a wonderful book about a young girl who at 15 gets a second chance at life. I was really impressed by this book and the way it was written. There is a message in this book and it is an important message. I will always read anything by this author, and the way this book was written made me think it was written by an author who had written many books, and not her first book! T R Lykins has written a clean romance suitable for teens and young adults. I was given a copy of this book as a gift. Alexia is a delightful young girl who enters her freshman year of college as a 20 year-old. A nearly terminal illness prevented her from starting earlier. Phillip is a college senior who is immediately attracted to the incoming student. The book is written in a "He says" and "She says" format. I truly enjoyed hearing the two viewpoints, but there were times when it felt a bit repetitious. This uplifting book will break your heart at time but the one thing it does do is inspire others to think more seriously about organ transplant and illness. The producer did a decent job with the male voices and an excellent job with the rest. I would definitely recommend this read to someone looking for a clean romantic story. A great offering for a first novel! I received this book from the author in exchange for an honest review. When I first started to listen to it, I was a little unhappy that it was college age as that is not my normal genre. As I listened, I totally got hooked. I loved going back and forth between Alexia and Phillip's points of view. It gives the book a richer quality and is great for character development. It felt like you knew these characters. I also enjoyed learning about organ donation, something I really haven't given a lot of thought to, and seeing how it changed the lives of these families was eye opening. The narration was wonderful, could easily tell which character was speaking and held my interest. I enjoyed this so much, I have purchased the companion novel, The Life Gift! Interesting story told from both points of view. Great narration. Story us told ftom both perspectives. A story about true love and transplants. You hear from Alexia and the next chapter is from Phillips point of view. Many coincidences lead to the ending. Some of the parts were expected and a few surprises along the way. Where does Last Heartbeat rank among all the audiobooks you’ve listened to so far? Audible Review: Last Heartbeat on audio is fun and interesting as the Narrator changes her voice to suit the character she's reading to you. 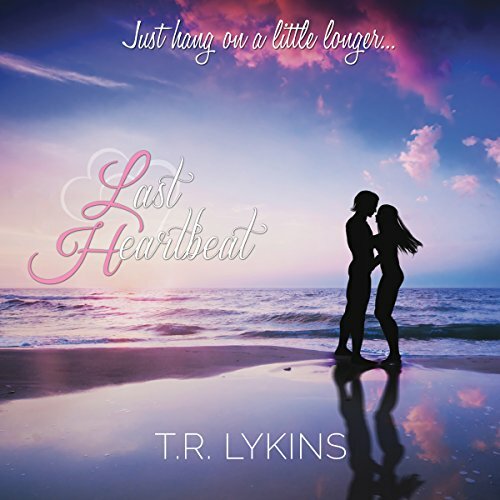 Story Review: Last Heartbeat is an emotional tilt a whirl sweet romance. I was immediately attached to both Alexia and Phillip and felt a kinship to them. Both of their histories remind me of someone I love. It was an instant freeze for me. Either I'm going to love this story or hate it. Well, I absolutely loved it. Their stories and health issues were written with great care and tenderness. With the the ups and downs of the relationship my emotions went right with Alexia's. At times I wanted to knock some sense into Phillip. He had my heart though and Alexia's as well. This story is a perfect story of love conquering all. This was a really good story about a girl and a boy who meet each other by chance and like each other at first sight. They've both had their own personal struggles and neither are sure about getting involved for concern of what the other might think. They're in college and Alexia's roommate Kristen talks her into going to beach parties where her and Phillip keep running into each other. They also have a class together and a mean girl Megan is always showing up trying to come in between them. I love the alternating chapters between Alexia and Phillip. Each one's inner dialogue as well as their outer dialogue is like a running journal of their worries and struggles. Neither of them tell each other what's holding them back but they're destined to be together. He calls her his 'blue-eyed princess' which is really cute. While listening to this I couldn't help but think my niece would like it. It's an overall neat story with light and sweet romance along with a powerful meaning and a heart-warming conclusion. I'd recommend listening to this one. Andrea Emmes does an excellent job narrating this book. She does the alternating voices of both Alexia and Phillip AND the supporting characters. She again proves herself as a talented voice actor. Another great listen from both Andrea and the author T.R. Lykins. What made the experience of listening to Last Heartbeat the most enjoyable? I really likes how she gave both his and her thoughts and both their retrospectives on what was happening. If you could sum up Last Heartbeat in three words, what would they be? A young couple that knows what the true meanings of life.